Comes in pack of 10! 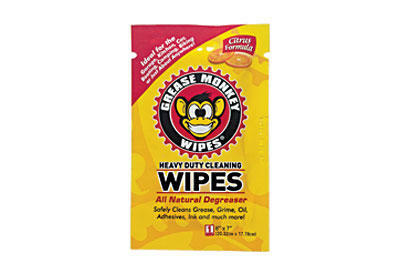 Grease Monkey Wipes use a powerful, citrus formula to safely clean grease, grime, oil, lubricants, adhesives, ink and much more. No soap and water, no problem. Pre-moistened Grease Monkey Wipes are ideal for cleaning mobile messes associated with biking, boating, driving, fishing, hunting, camping, and much more.